La propriété est située dans Calusa Campground, une communauté privée et sécurisée fermée. Idéalement situé dans le centre de Key Largo à une courte distance de nombreuses attractions et activités. Avec dans notre communauté avec une piscine chauffée avec une terrasse, court de tennis, terrain de basket, terrain de jeux, et Marina avec une rampe de bateau. Ce est notre paradis, notre maison loin de la maison. Avec les couchers de soleil les plus étonnantes et belles. Nous sommes également Golf Cart sympathique communauté et nous allons inclure la voiturette de golf sur la photo pour un montant supplémentaire basé sur la durée de votre séjour. Merci de visiter notre liste et nous espérons que vous avez une grande et merveilleuse vacances. The home and grounds were very clean and nicely done. It is an older trailer with slide outs on one side. The enjoyment was tempered when my wife on day 3 broke her ankle and required surgery. The trailer became somewhat of a challenge in navigating on crutches. We managed. Willie the host was very accommodating and sympathetic to my wife's plight. We chose to rent his golf cart in order to enjoy the amenities of the park. Near the end of our 30 day stay we had some water issues with the bathroom sink leaking under the cabinet. We notified Willie and determined that it was not an immediate emergency, but he would take care of it as soon as possible. Then a few days later a very bad leak developed at the hot water heater in the closet on a Friday night. I texted Willie and he called right back. Ihad found the shut off at the water heater and activated it. He had a plumber out the very next day on Saturday. Within less than one hour the hot water tank and faucet in the bathroom were repaired. He addresses any problem large or small immediately. The park (Calusa Campground) was very well taken care of and has a very nice pool. The laundry rooms were extremely clean and well taken care of. The outdoor TV with external speakers was a definte plus. All in all it was a very good experience. And in addition, due to the water problem, Willie did not charge us the use of the golf cart and we received a full refund on our security deposit. Willie and I had several interactions and every time he inquired about my wife's health and well being. 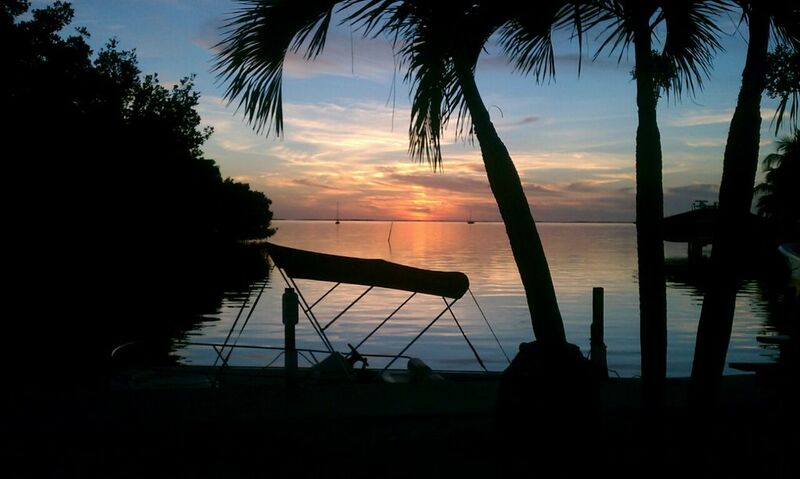 We highly recommend a stay at Paradise Cove in Key Largo. We were pleasantly surprised at how spacious everything felt. The outdoor accommodations were wonderful! Everything was nice and clean, and well supplied for cooking or grilling. The property felt very safe, and everyone was friendly. We walked the premises, but sort of wished we had rented Willy’s golf cart, because everyone has one, and we felt sort of left out ;-). The dock was a great spot from which to watch the sunset. Get there early to secure a hammock chair! The pool was great, with plenty of spots to find sun or shade. There are several covered pergolas with seating and tables, and tons of sun lounge chairs. We found it easier to bring our own sun chairs to the pool, as the ones provided looked nice, but were hard to use (the back supports were mostly broken). It was fun to walk around the “campground” and see all the setups people had outside their homes. I use the term campground loosely, because no one is really camping, more like glamping (glamorous camping). Some homes were more simple, and in need of a little TLC, but there were so many elaborate outdoor settings, we were impressed! Overall, nice place to visit. We usually stay in the Lower Keys and Key West, but wanted to explore Key Largo for the first time. We enjoyed Pennekamp State Park, dining at The Boathouse, and viewing the sunset at Snook’s. You have to drive everywhere, nothing is really walkable, which is ultimately why we prefer Key West, but Willy’s place was fun, too! Great property, cozy and friendly area! This is a great property with all the comforts of home! It was clean and had all the amenities that we needed. The outdoor area was an extra benefit! We had our two kids and our dogs with us and there was plenty of room both inside and out. The owner was available if we had questions, as was the campground security. Everyone was super friendly! The campground also has a nice pool, newly renovated playground and two laundry facilities (coin operated). Manatees and American Crocodiles in the mangroves at the back side of the park! Super cool! Willy's property perfect for our first Key's stay! Will's property was perfect for our first retirement extended stay in the Key's. The property was exactly as advertised, Willy was very responsive on any of our questions or needs. The campground and amenities were awesome especially the pool and marina. People were very friendly, the campground was very pet friendly, it worked out perfectly for us. I even had an opportunity to play tennis and recreational boat with other guests. The trailer was clean and comfortable. Everything we needed was provided with the trailer. The property is located near grocery shopping, various stores, and great restaurants! Recommend the golf cart it allows you to get around very efficiently. Wonderful stay thanks again. I am very happy that you enjoyed your first retirement vacation so much. It was truly a pleasure having you. Hopefully you can continue coming back every year to our little piece of paradise. Again, thank you very much for taking such great care of our home. BOOKED BEFORE WE LEFT FOR NEXT YEAR!!!! I stayed at this property with my dad after he finished up chemo for a month of R & R! I had no idea what I was in for but it was completely awesome! The campground itself is more of a "GLAMpground" and we had so much fun! We made wonderful friends who all plan to meet back again next winter! The pool is amazing and the sunsets at the dock are second to none. The amenities of the trailer itself were clean, comfortable and felt like home. Everything you need! I recommend adding the golf cart, definitely worth the extra money, especially for taking laundry to the laundry room and for sunset cruises after swimming all day! The fruit market is within walking distance and is incredible. There is a plaza right across the street with groceries, kmart, liquor store, nail spa and more! Can't wait to come back! Thanks so much Willie!